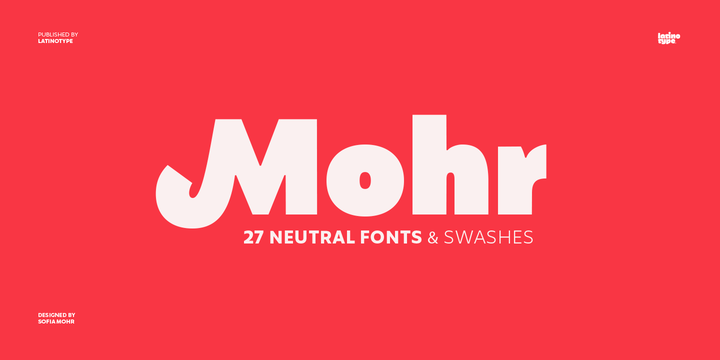 Mohr is a sans serif typeface creted by Sofia Mohr and published by Latinotype which is available in three widths (Regular, Alternates, Italics) each with 9 weights (from Thin to Heavy) and useful OpenType features. This family font is based on huministic elements but is a neutral and versatile font which can be use in many applications. It is suitable for display use, editorial, logo, magazine, poster, title etc. Have fun! Price: starting from $29,00 for one font to $169,00 for all 27 fonts. A font description published on Tuesday, April 3rd, 2018 in Fonts, Latinotype, Sofia Mohr by Alexandra that has 1,854 views.